"Working together with 3M and utilizing their outstanding design and supply chain capabilities will allow our quantum dot technology to be widely deployed across all product segments, ensuring availability to all customers." ST. PAUL, Minn.--(BUSINESS WIRE)--3M announced today it is in the final stages of scale-up for its new 3M™ Quantum Dot Enhancement Film (QDEF). The new film allows up to 50 percent more color than current levels in liquid crystal display (LCD) devices. 3M has teamed with Nanosys, Inc., to produce the 3M QDEF solution specifically to deliver more color, and to make devices such as smart phones, tablets and televisions, lighter, brighter and more energy efficient. 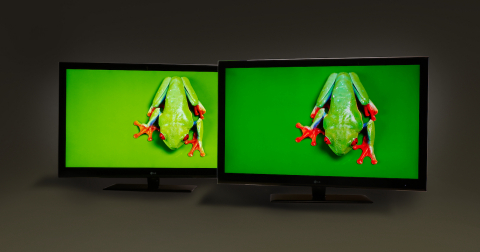 Current LCDs typically are limited to displaying 35 percent or less of the visible color spectrum. This means the viewing experience on an LCD can be vastly different than what a person sees in the real world. Wide color gamut displays will allow consumers to enjoy more visceral, more immersive and truer-to-life color. Over the years, 3M light management technologies have made LCDs thinner, lighter and more energy efficient. Color performance of LCDs industry-wide has gone largely unchanged until now. 3M research data shows that devices with 3M QDEF-enabled wide color gamut will be noticeably different from other standard LCD devices, prompting the human eye to dwell on the display longer than less-saturated displays. QDEF utilizes the light emitting properties of quantum dots to create an ideal backlight for LCDs, which is one of the most critical factors in the color and efficiency performance of LCDs. A quantum dot, which is 10,000 times narrower than a human hair, can be tuned to emit light at very precise wavelengths. This means display makers can create a highly-optimized backlight that only produces the exact wavelengths of red, green and blue light needed by an LCD for optimal color and energy performance. Trillions of these quantum dots protected by barrier film fit inside an LCD backlight unit. The new film replaces one already found inside LCD backlights, which means the manufacturing process requires no new equipment or process changes for the LCD manufacturer. Both 3M and Nanosys, Inc., will attend Society of Information Display’s DisplayWeek, May 21 – 23, 2013, in Vancouver, British Columbia. For more information: www.displayweek.org. Note to Editors: Media interested in seeing the new 3M™ Quantum Dot Enhancement Film (QDEF) firsthand during SID DisplayWeek should contact Stacey Voorhees-Harmon at 926.336.9592 or via e-mail at stacey@savvypublicrelartions.net. Additional photos are also available upon request. Follow @ImmersedInColor on Twitter. Nanosys, Inc., is an advanced material architect, harnessing the fundamental properties of inorganic materials into process ready systems that can integrate into existing manufacturing to produce vastly superior products in lighting, electronic displays, and energy storage. For more information, visit www.nanosysinc.com. 3M captures the spark of new ideas and transforms them into thousands of ingenious products. Our culture of creative collaboration inspires a never-ending stream of powerful technologies that make life better. 3M is the innovation company that never stops inventing. With $30 billion in sales, 3M employs 88,000 people worldwide and has operations in more than 70 countries. For more information, visit www.3M.com or follow @3MNews on Twitter. © 3M 2017. All Rights Reserved.